Thanksgiving is coming up, with the other winter holidays not far behind. That means it’s fancy food time! 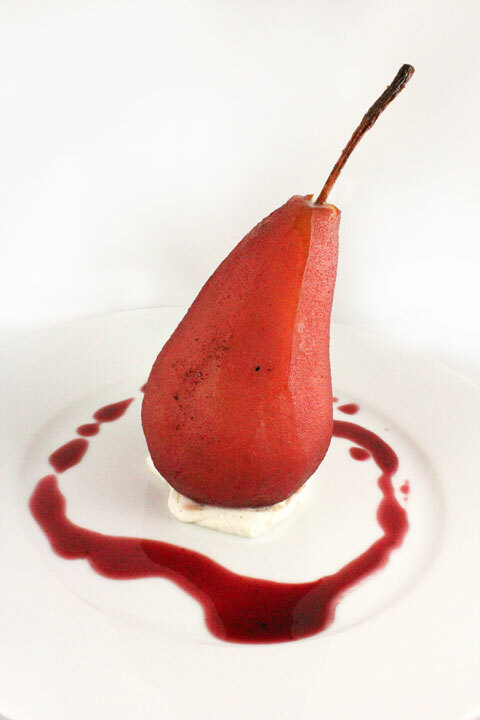 I made poached pears with mascarpone for New Year’s Eve a few years ago. Charles and I loved them. They were so rich and decadent — a wonderful way to ring in the new year. It was a recipe I wanted to revisit, but when it came to finding the original, I couldn’t locate it. Google gave me many options, but none of them were exactly what I had done before. So, as I do so often anyway, I decided to make it my own. We just received our final Farm to Table shipment from Pennyroyal for the 2014 season, and I thought using some of my coveted Laychee cheese for poached pears would be amazing. It truly was. I poached the pears in Sobon Estate’s Old Vines Zinfandel. Its fruit-forward richness was a perfect choice to go with the pears and spices. Remember, never cook with a wine that you wouldn’t drink, but make sure its characteristics will compliment the other flavors in the food — much like choosing a wine for pairing. vanilla bean, split and insides scraped into a bowl. Put wine, sugar, spices, salt, and the remains of the vanilla bean in a large sauce pan over medium heat. Stir until sugar dissolves. Add pears and bring to a simmer. Cook for 40 minutes, turning the pears every ten minutes so they get a lovely, uniform red. Remove pears and continue to cook the liquid. Reduce the liquid until it’s syrupy. You can use this for ice cream or any other dessert where a syrup would be a nice addition. Add whipping cream and cheese to the bowl with the vanilla bean innards. Stir with a rubber spatula until well blended, then scrape into a reclosable bag. Cut a corner off the bag and pipe the cheese mixture into the pear. Place the stem back on the top for a pretty presentation.